When the actors glean so much contextual meaning out of individual lines, you begin hearing things you might not have noticed before, no matter how many times you have seen or read the play. American Shakespeare Center, Method in Madness Tour, Blackfriars Playhouse, Staunton, Va.
To do "To be or not to be," or not to do "To be or not to be" is sometimes the question. Whether 'tis nobler for the actor to suffer the expectations of knowledgeable audiences, or to take action against a sea of mouthers, and, by surprising, stop them. 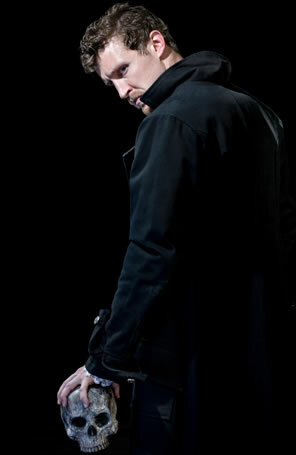 Patrick Earl as Hamlet in the American Shakcespeare Center's touring production of William Shakespeare's Hamlet. Photo by Michael Bailey, American Shakespeare Center. Actors playing Hamlet and trying to create something new out of something so ingrained in our collective conscious will do anything to get out in front of William Shakespeare's most famous speech. Efforts range from waiting interminably long before speaking to sprinting into the soliloquy before anybody has a chance to see it coming. I've seen a Hamlet sitting in the audience speaking thoughts on to be or not to be to a nearby patron. I've seen a Hamlet spray-paint "2B" on a wall, pausing, then painting a circle around it and a single line across the middle to create the international traffic symbol that you can not 2B here. "That, is the question," the vandal Hamlet said, pointing at his artwork. The latest Hamlet to tackle this dilemma is Patrick Earl in the American Shakespeare Center's Method in Madness Tour production. How he succeeds so satisfyingly in his approach to the speech will be discussed in due course, for it's just one of many surprising yet apt deliveries of the verse in a tantalizingly fresh production full of of unforeseen yet insightful twists and turns. This is the third time in five years ASC Co-founder and Artistic Director Jim Warren has helmed this play in the company's home theater, the Blackfriars Playhouse in Staunton, Va. As always, he eschews any and all conceptual conceits, and true to ASC's operating creed, this text-centric production is played on a bare stage with universal lighting and universal costuming. Instead, Warren and his cast dive deep into individual lines to find hidden truths and alternative purposes. The first example comes just seven lines into the play when the sentinel Bernardo (Emily Joshi-Powell), arriving to relieve Francisco (Alexandra Leigh) of the watch, asks "Have you had quiet guard?" It seems a throwaway line, and yet here Joshi-Powell acts out a clear subtext: what her Bernardo really wants to know is whether Francisco has seen any ghosts. The most surprising example comes in the graveyard scene, after Hamlet and Laertes (Patrick Poole) grapple over the body of Ophelia (Susie Parr). Earl speaks Hamlet's line, "What is the reason that you used me thus?" while turning his attention to Ophelia. Straddling her, he continues: "I loved you ever," he says as he strokes her face and then kisses her forehead. This is, indeed, quite a contrast to the demonstrative affection for Ophelia that Laertes had shown earlier in the scene. There is no seeming in Hamlet at this point. There certainly is a lot of seeming in Hamlet otherwise, though. When he tells Horatio (Tim Sailer, playing the best friend as an arrogant intellect) and Marcellus (Andrew Goldwasser) that he intends to "put an antic disposition on," boy does he. Earl's is a madcap Hamlet in his public scenes, but it is all acting, drawn from his infatuation with theater. Hamlet's instructions to the actors also inform his approach to his own performances in Elsinore. "Do not saw the air too much with your hand, thus," he tells the actors. "O, it offends me to the soul to hear a robustious, periwig-pated fellow tear a passion to tatters." Then, after the players have departed to make ready and the royal party approaches for the play, Earl's Hamlet acts exactly as he tells the players not to act. He delivers the "chameleon's dish" line to Claudius (Ben Gorman) like an affected tragedian; in over-the-top jester mannerisms, he asks Polonius (Stephen Brunson) about his playing Brutus at the university; and he is slapstick silly as he approaches Ophelia about laying his head in her lap. In his scenes with Rosencrantz and Guildenstern (Joshi-Powell and Goldwasser) he's overly solicitous of their good favors, and when he approaches the hallway where Claudius and Polonius have planted Ophelia, we can hear Earl offstage singing in a high-pitched child's voice, "I Just Can't Wait to Be King," from The Lion King, before he skips merrily on stage. That song, by the way, was written by Elton John (with Tim Rice), and to continue in this strain, what Earl does next is more like the Elton John–Bernie Taupin–penned "Your Song." I've seen Elton John in concert about as many times as I've seen Hamlet on stage (this production is number 19, not counting filmed versions), and when Elton starts playing the opening chords of "Your Song," the arena shakes and everybody—everybody—sings along. Elton doesn't change a thing to the song: he's played it umpteen million times on stage, and yet when he gets to the coda, his head tilts back, his eyes gaze out over the crowd, and he basks in the fact that he's playing and singing one of the greatest songs ever written while we the audience are transported along with him to that special place that only great art can take us. Hamlet's "To be" soliloquy is Shakespeare's greatest hit, and it tops the literary and dramatic charts by being a brilliantly composed and artistically beautiful passage. You can rock it, roll it, turn it into the blues, make it a spiritual, give it a twang, or use it as a raga, but nothing beats letting "To be" be, as Earl does. Earl's Hamlet stands there, pauses a brief moment as he looks out into the audience, the smile from his childish entrance still on his face, and then easily, smoothly, asks that famous question and speaks the next 32 lines trippingly on the tongue, suiting the action to the words, never overstepping the modesty of nature. So simple, so perfect, and yet so Hamlet. For it is in his soliloquies that we find the true Hamlet of Earl's portrayal, a troubled young man with superior intellect, the slings and arrows coming at him from so many different directions: his father's death, his mother marrying his uncle and too quickly, his uncle interfering with his own ascension to the crown, his being in Elsinore instead of Wittenberg. On top of all this, the ghost of his father shows up, his girlfriend suddenly starts acting cold toward him, and everybody else is playing him including his two old friends. For Earl, the centerpiece speech is "O, what a rogue and peasant slave am I." He makes it the most moving passage of the play as his frustrations at the world and his own cowardice, infused with his grief-prompted depression, lay bare a raw psyche. "It cannot be but I am pigeon-livered and lack gall to make oppression bitter." So heartbreaking is his psychological self-immolation that I heard at least one woman sobbing in the audience. When the actors glean so much contextual meaning out of individual lines, you begin hearing things you might not have noticed before, no matter how many times you have seen or read the play. After the Ghost's departure, Hamlet speaks a flourish of farewells to his father before turning to the matter at hand—except the first thing out of his mouth is "O most pernicious woman!" and then he says, "O villain, villain, smiling damnèd villain!" which, we presume, is referring to Claudius. Despite the fact he has just been informed of his father's murder and moved to avenge it, Hamlet still obsesses first and foremost with his mother's marrying his uncle. She knows it, too. Stephanie Holladay Earl carries a troubled countenance in the opening court scene, that of a woman feeling a tad out of place. She later tells Claudius, flatly, that she believes her son's distemper is due to "no other but the main—his father's death and our o'er-hasty marriage." But is she an accomplice to the murder? Not according to the Mousetrap scene, in which she watches with blank expression the players act out the murder in the garden, and then is surprised by Claudius's sudden consternation. But in the closet scene, she is dealing with a son she knows to be acting crazy of late, who right before her eyes impetuously murders Polonius hiding behind the arras, and who then speaks to some phantasm of his brain. Holliday Earl's Gertrude is a nervous wreck at this point. Aside from the nuances in the lines, this production relies much on the nuances of staging and action. In the opening court scene, after dispensing with the business about Fortenbras, Gorman as Claudius turns to Hamlet and then, instead, deliberately turns to the matter of Laertes. Hamlet notices. When presenting his notion to the king and queen that love of Ophelia has driven Hamlet mad, Polonius has Ophelia read out loud the love letter that Hamlet had sent her—a tough spot to put the girl in, you think? In his scene with Ophelia, as he commands her to a nunnery, Hamlet becomes tempestuous (doesn't seem to be seeming here, either) and throws his letters she's returned to him into the air. They scatter upon the stage floor, and Hamlet spends the next scene, as he is talking with Polonius, gathering them up. He is reading one of his notes when Polonius asks him what he's reading. "Words, words, words," Hamlet replies sadly; worthless words, Earl's expression says. In her scene of madness, Ophelia tears out strands of her hair that she presents as her flowers. She is wearing her father's cloak over a white slip and sheer robe. In Gertrude's closet scene, the ghost (Josh Innerst) reaches out to Gertrude, but she can't see him, and disappointed he moves off. Innerst also reaches an intriguing timbre with his description of his purgatory. "O horrible, O horrible, most horrible!" is not a wail, nor a whisper; he speaks the words as a pervading thought that has such a tight grip on him it squeezes tears from his eyes. During the Mousetrap, Claudius and Gertrude ignore the dumb show as they engage in a private, loving conversation. Hamlet watches them anxiously, and when the play proper begins he hovers over his mother and stepfather to make sure they note the action. In fact, Warren has staged the entire Mousetrap scene as a theatrical equivalent to a long tracking shot in cinema: so much is going on all around the theater. To the right of us Rosencrantz, Guildenstern, and Polonius are watching the play and watching Hamlet, Hamlet and Ophelia are among the gallant stools to the left, she watching the play, he watching the king and queen who are back right doing their own dumb show, the actors are center stage engaging in comic bits in response to Hamlet's interjections, and Horatio observes it all while playing the recorder to the back left. For all its focus on the text and the fact it uses no sets and few props, this production is, in fact, most visual. Part of that is the acting (and reacting). Part of that are the costumes by Victoria Depew who dresses the characters thematically. The king and queen wear classic renaissance royalty—they could have stepped out of a deck of cards—and Polonius, too, is dressed as a renaissance courtier, but he looks like he has a tapestry draped over his shoulder. Like her father, Ophelia wears an Elizabethan ruff collar around her neck, but on her feet are Converse open-toe All Stars, and her short skirt and turquoise corset with a net of embroidered flowers over her shoulders make her look like a ballerina in a Degas painting. Compared to Horatio (jeans vest, red pants, fedora, and boots), Laertes (turquoise tunic jacket, blue jeans, brown riding boots), and Hamlet (black leather jacket, black tee, black pants, black boots), Rosencrantz and Guildenstern look old-fashioned in their vests and ties. As the Ghost, Innerst is dressed in medieval knight's armor but covered in a cobweb-like hooded cloak, the material seeming to cling to the spikes on his armor as if he'd tried to remove the shroud that had covered his body. However you wish to approach Hamlet—as extraordinary literature, as an early modern classic drama, as film noir suspense, as fun theater—this production pleases. As a bonus, you get the musical performances by this multitalented cast before the play and during the intermission with such thematic choices as "Crazy" by Gnarls Barkley, "The Pretender" by the Foo Fighters, "Changes" by David Bowie, "Helplessness Blues" by Fleet Foxes, and Anna Kendrick's Cup Song ("You're Gonna Miss Me"). Yet, the show's highlight is the longest chart-topper of all time: "To be or not to be." Why that is so surprising is what makes this so accomplished a production.